The Writers Guild of America West set out a schedule for its plan of action Monday night amid ongoing negotiations for a new contract with the AMPTP. In a letter sent to members, the union said it is “returning to the bargaining table” on April 10, with Los Angeles member meetings set for April 18 and 19. The online strike authorization vote will begin April 19 at 8:30 p.m. PT through April 24 at noon PT. Members eligible to vote will receive a separate email with more specific voting instructions and additional meeting details, including a link to RSVP. We will be returning to the bargaining table with the AMPTP for the week starting Monday, April 10th. We continue to need your support to achieve a fair contract before the May 1st expiration date. Los Angeles member meetings are on Tuesday, April 18th at the Sheraton Universal at 7:00 pm PDT and Wednesday, April 19th at the Beverly Hilton at 7:00 pm PDT. The member meeting in New York will be on Wednesday, April 19th at the SEIU 32BJ office at 7:00 pm EDT. The online strike authorization vote will start on Wednesday, April 19th at 8:30 pm PDT/11:30 pm EDT and conclude on Monday, April 24th at 12:00 noon PDT/3:00 pm EDT, and will be conducted through Votenet. With OJ Simpson seeking parole, let's look back at "The People v OJ Simpson," FX's mostly accurate dramatization of his murder trial. Lead writers Larry Karaszewski and Scott Alexander told us about a few instances where they took dramatic liberties. Johnnie Cochran remarks in the first episode that he can't wear lime green because it scares one of his clients, Michael Jackson. 2. They Eliminated Some Lawyers. "I don't think we went out of our way to make up anything in particular. ... It's all about condensing and simplifying," said Karaszewski. "There were more lawyers on both teams, there were people sitting at that desk everyday with Johnnie and with Marcia [Clark] who never got a shot on TV, and they did some important things." 3. They Changed Who Said What Sometimes. "If an episode was on a roll trying to play up different problems between Johnnie and Chris [Darden], but Lee Bailey happens to have asked a really pointed question of one of the witnesses, that line may work better for us to give to Johnnie," Alexander said. "I don't know if we're breaking any biopic laws by handing lines across the defense team." In the show, Darden says he should be held in contempt, and Clark offers to remove her watch and jewelry to go to jail. Using the series' timeline, the proceeding would have happened around late August or early September, but it actually happened in February. That's OK, say the writers. "There were two sort of Chris Darden meltdowns in the court, and you know, obviously in making a drama out of this, we made it one. I think we were very, very faithful to the events that happened," said Karaszewski. "The takeaway from both of their books is they spent a lot of time together, they were very close, they seemed to be attracted to each other, they took a trip up to the Bay Area, and they were in adjoining hotel rooms and they had a moment in the hallway. So whether he was 10 feet or three feet, I don't know. I wasn't there," says Alexander. Adds Karaszewski: "And also both of them were very, very coy about what happened, and in all fairness to us, we say nothing happened." 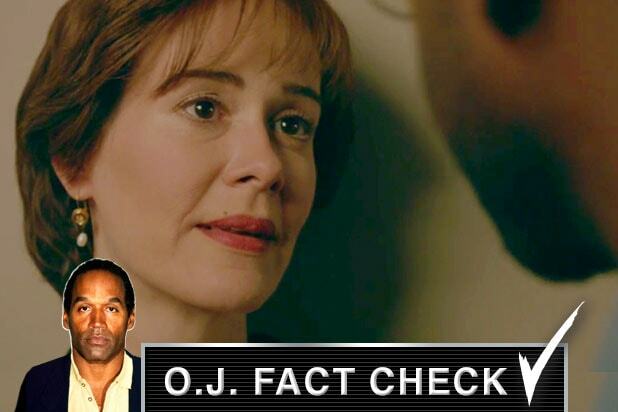 ... and here are some of the weird details of the O.J. Simpson trial that they didn't delve into.